Late Friday night, the EBEX and CSBF folks headed out to the LDB facility for a launch attempt sometime Saturday morning. I had initially thought about setting an alarm to get up and watch the launch, but I decided not to at the last minute. That worked out ok, since when I woke up just before a 10:30am conference call, EBEX was out on the launch pad but the balloon was not yet laid out. After our conference call, we got the word that CSBF was going to go ahead and lay out the balloon, in preparation for an early afternoon lunch. I then went over to grab lunch (Duck Quesadillas. Yesterday we had Duck Grilled cheese. I guess there's a lot of leftover duck from something. It's a harsh continent.) with JohnE and some of the BLAST crew. By the time we finished lunch, we got word that inflation had started, so I headed out to the west side of Observation Hill, and walked a little bit of the loop around the hill until I got to a spot with a nice view of the LDB site. I then sat around for about 40 minutes, but in that time I got to see a helicopter fly by and land at Scott Base, and also a skua flying around. Eventually, the CSBF folks released the balloon and EBEX started slowly drifting up towards the sky. As it made its way up, I hiked the rest of the Observation Hill loop. It was cool being on the parts of the trail where literally the only sign of humanity was the hiking trail I was on and the balloon above. After hiking the loop, I went over to Hut Point to see if there were any penguins. There weren't, at that point, so I went back to my room and showered. A little bit later, JohnE let me know that he had indeed seen a group of penguins out at Hut Point, about 20 or 30 meters away from shore. 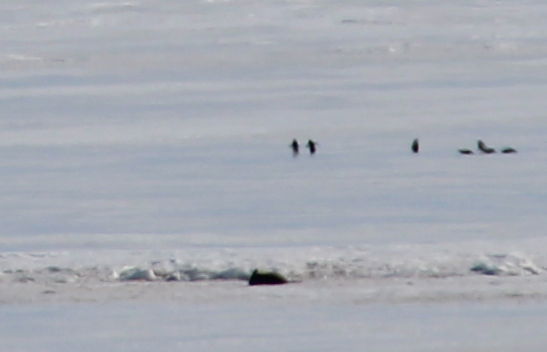 He got to see them hop over a crevasse and walk by the seals that are still lying around out on the ice near McMurdo. Penguins on the left near the top. I went out and could see them off in the distance, but wasn't able to take a really clear picture. Still, this time I actually knew I was taking pictures of penguins and tried to make them a little less pixellated. It didn't work. I'll keep heading out to Hut Point every day to see if more penguins show up, which they hopefully will. Did you know that you can create short urls with Shortest and earn $$$$ for every click on your shortened urls.